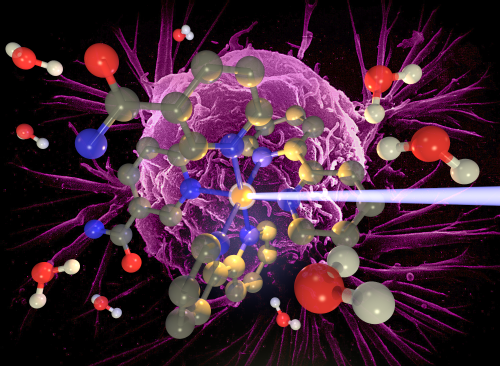 Anticancer drugs that are activated by light - prodrugs - provide enhanced drug selectivity; a chosen spatial area containing the drug can be selectively activated by light. Next generation prodrugs with improved selectivity include Ru-based polypyridyl-complexes. These prodrugs typically undergo photoexcitation and subsequent ligand exchange with H2O, creating a species that then readily binds to DNA and other biomolecules. However, there is a limited understanding in the underlying mechanisms that drive ligand exchange. Transient absoprtion experiments at WCUS offer unprecedented insight into both the electronic states, and key atomic motions driving ligand exchange. Such understanding will facilitate development of prodrugs with enhanced ligand exchange capabilities and thus improved efficacies. Maleimides can be incorporated into a nanostructure (e.g. in-cell delivery platform) and used as an emissive reporter with a nonambiguous location in the nanostructure, providing an elegant way to track nanoparticle degradation in vitro. Whilst maleimides are highly emissive fluorophores, the reason for their high fluorescence quantum yields remains elusive. Probing fluorescence emission in real time using may hold the key to understanding why fluorescence quantum yields crucially depend on which functional groups are attached to the maleimide, offering a user-controlled ‘dial’ (functional group) to tune the fluorescence quantum yield to suit the need.